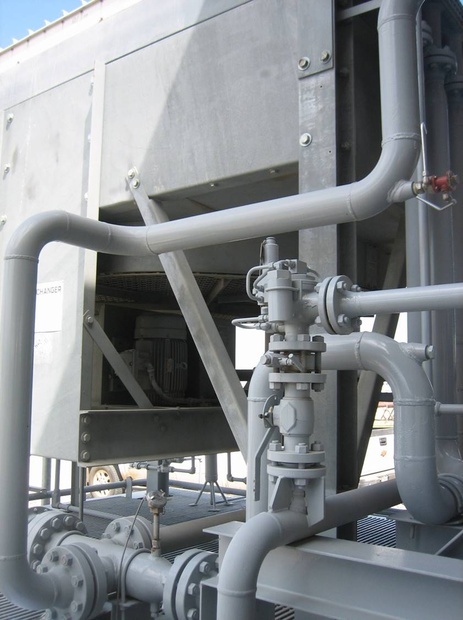 PICT technology controls compressor interstage temperatures to prevent condensate from forming. The PICT valve regulates the gas flow through the aftercooler to control the interstage temperatures. The temperature setting is determined by the vapor dew point and potential hydrate conditions. PICT technology can be retrofit into existing aircooled compressors. The number of systems depends on the gas composition and operating conditions. High BTU (heavy) gases have a dew point temperature higher than the interstage aftercooler temperature on air-cooled compressors. These overcooled hydrocarbon gases condense in the compressor interstage scrubbers and can trigger out-of-control recycles or require bullet tanks for collection of volatile liquids. Process Interstage Controlled Temperature gives you the ability to regulate your compressor’s interstage temperatures. By controlling these temperatures, you can make sure your compressor is operating above the dew point of the vapors and prevent liquids forming. Since the vapors are kept above their dew point, they are sent into the pipeline.